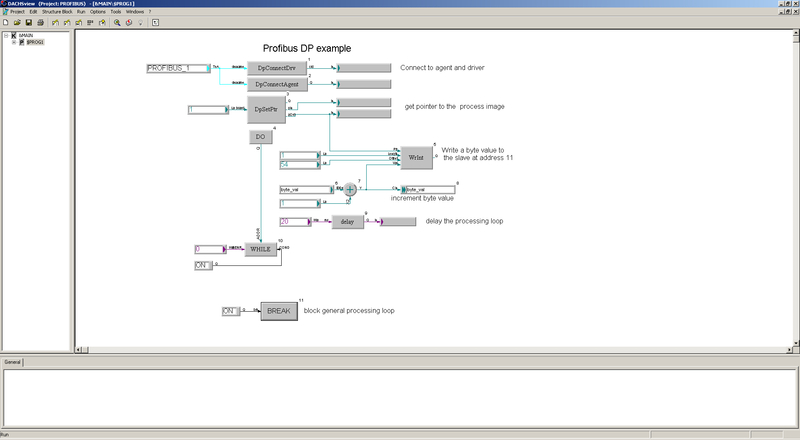 DACHSview++ is an innovative general purpose graphical programming system and visualization tool which is based on graphical function block display. It covers all aspects of today’s industrial automations by a set of specific function block libraries and a JIT compiler for C/C++ based function block code. It is available for QNX Neutrino RTOS v. 6.x and Linux. Why programming with function blocks? The executable code of function blocks are based on C++/ C, that means funtion blocks are representing the next higher abstraction level of that C++/C code. Programming with function blocks can be considered as the configuration of the interconnections and dataflows between function blocks.This can be done simply by serveral mouse clicks! It avoids also the need to need to know the syntax of C++/C or a deeper knowledge e.g. about fieldbus systems. The graphical code is independent from the operating system! Write once and let it run where the DACHSview++ targets are running!